The Green Assets Wallet innovation project, funded and co-developed by the Emerging Markets Dialogue on Finance of GIZ by BMZ, is finishing up the Beta Phase of the technology build. Partners convened to participate in a demonstration of the technology and to discuss final elements and next steps. Next up is the GAW Test Phase when issuers of, investors in, and validators of, green debt will get to test the technology and provide feedback on a Workshop on September 27. 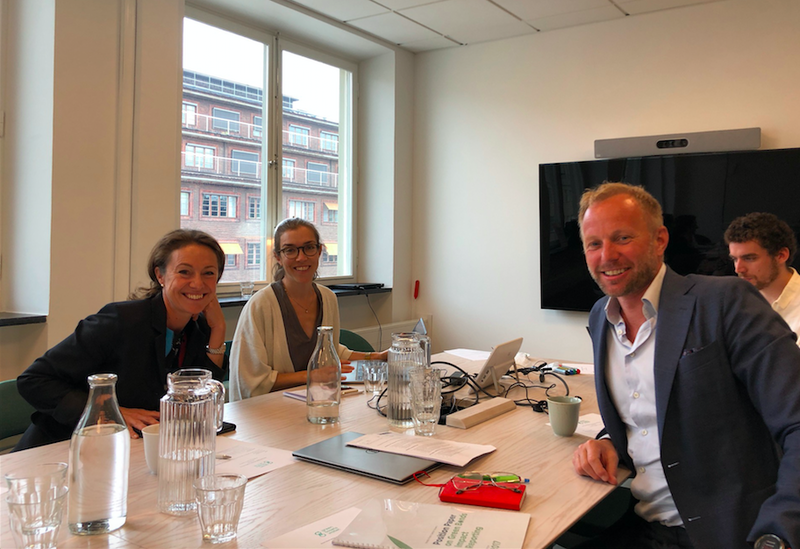 Photo: Anna Denell, Sustainability Director Vasakronan, Anna Bellander, Stockholm Green Digital Finance, Harald Lund, Head of second opinion CICERO and Gus Botsford, Chromaway defining impact reporting in the Green Assets Wallet. Going forward, a key focus is on making investment opportunities in Emerging Markets more accessible to investors. The GAW team is currently working with early issuers of green debt in Emerging Markets to demonstrate a wider range of investment products -and with greater impact! -If we invest in solar in Sweden, we meet one SDG. If we can find a solar investment in Africa, we can meet up to 7 SDGs, reaching beyond clean energy targets to gender, equality and health, said Åke Iverfeldt, CEO Mistra. Another key element of the GAW project is knowledge transfer. Working with best in class real estate company Vasakronan helps set the stage and lead the way for "green building impact reporting" for new issuers of green debt.